Summary: Non-voters are our largest political “party”, mostly ignored by gurus in the new media. Neither the Left or Right has successfully appealed to them. The first to do so with even modest success will dominate our government, perhaps for generations. Graph of the silent plurality by Andrew Gelman (Prof Statistics & Political Science, Columbia) from his website. When it comes to public opinion, the story is different. The Democrats may well benefit in 2014 and 2016 from the anticipated slow but steady recovery of the economy over the next few years — but, as of 6 November 2012, the parties are essentially tied, with Barack Obama receiving 51% of the two-party vote, compared to Mitt Romney’s 49%, a split comparable to Al Gore’s narrow victory in 2000, Richard Nixon’s in 1968, and John Kennedy’s in 1960. Over the next few months, you will be hearing a lot about Obama’s non-mandate, and rightly so. But here I want to talk about a slightly different split of the voting-eligible population: the approximately 30% who voted for Obama, the nearly identical number who chose Romney, and the 40% who did not vote at all or who voted for minor-party candidates. Update from the comments: SDW points us to “Nonvoters: Who They Are, What They Think“, Pew Research, 1 November 2012. Our two major parties are almost equal in strength. Small factors determine who wins each election. Such as the slow GDP growth that gave the winning edge to Obama, geopolitical events, even the geographic distribution of votes. Our winner take all system can magnifies even small wins in the popular votes into large outcomes in Congress (although not this year). Offsetting this, the Constitution’s political machinery prevents rapid change except when one party has the Presidency and large majorities in both the House and Senate. That’s almost impossible to achieve when the parties have almost equal strength. This situation will tip eventually. Until then there are two scenarios we should watch for. Sometimes a nation’s political machinery fails to work due to circumstances and personalities. Such as those that produced the English Civil War (1641 – 1651). Today’s delicate balance of power between the two parties probably makes this kind of failure more likely, as does the intense rhetoric deployed by both sides (largely, IMO, to disguise their similar policies). (b) The balance of power lies in the non-participants. The plurality of non-voters offers the potential for one party to gain a decisive edge. Swaying even a small fraction would suffice. This is potentially a far larger factor than the “swing” or “independent” voters, in fact a tiny group important only because the parties are so close in size. Who are the non-voters? Mostly are what political scientists charitably call “low information” citizens. Many are low-income. Many are young. Another large fraction, other than including some of the young and poor, are disaffected citizens. They have lost confidence in the political system, or the government, or even our political regime. Some are have fringe beliefs, outside the political mainstream. A small change in their participation could radically reshape the political landscape. This is, IMO, easier to do than achieving a large change in party allegiance, which is quite stable in the US. The party that finds a way to mobilizes even a small number of these will run America for the next political generation. Pundits are quickly turning to immigration to explain the Republicans’ Latino problem and to offer a possible cure, but the reality is that the rot cuts much deeper. The GOP doesn’t have a problem with Latino voters per se. Rather, it has a problem with a broad spectrum of voters who simply don’t feel that it’s speaking to their economic concerns. The GOP has an economic agenda tilted strongly to the benefit of elites, and it has preserved support for that agenda — even though it disserves the majority of GOP voters — with implicit racial politics. They should be a natural Republican constituency: striving immigrant community, religious, Catholic, family-oriented and socially conservative (on abortion, for example). Making the GOP a multi-ethnic party is perhaps their greatest strategic challenge. Solving this might open the politically uninvolved to the GOP’s song. I believe the current party system has decayed, just coasting on the money of our ruling elites and institutional momentum. The symptoms are visible, if we care to look. The grossly unrepresentative Senate, much like the rotten boroughs of 18th century England. The increasingly inexperienced — often weird — candidates that dominate Federal elections. The convergence of the two parties’ policies. These result in a weak political system, vulnerable to take-over by an organized groups — especially one with a charismatic leader. A group that appeals to the plurality of non-voting citizens, mobilizing them to ends outside the imagination of today’s party leaders. History offers many examples, most fearful to behold. The coming years might hold large surprises for America. Conservatives, celebrate the historic victory you won today! Civil rights just took a step forward, the slow hard way. The right way. Previous Post Civil rights just took a step forward, the slow hard way. The right way. Next Post Is There Hope for the Rule of Law in America? This became on of the major rhetorical themes of the Nixon Administration’s rhetoric. It was used to divide the public into “them” and “us”, and mobilize support. That’s how mass movements are born. Fortunately Nixon was not a charismatic figure — and his paranoia destroyed both his second term — and damaged the GOP. The problem with analysing non-voters is apparently that an unknown number of them refuse to be interviewed or polled. We get to hear what those who are willing to be interviewed have to say but don’t know if they are representative. I wish I could find the article I read about this but it’s an opinion because the data is unknowable, Pew Research does have report on non-voters who agreed to be interviewed here: “Nonvoters: Who They Are, What They Think“, Pew Research, 1 November 2012. Thank you for posting this. I’ve added it to the post (with a hat tip to you). Another issue I think, that occurs with the non-voting citizen is this; people want the option of voting for a candidate that represents their ideals and beliefs. We today (as has been mentioned through out FM’s posts) do not have a balance between left and right ideals. I had issues voting this year (first time I have voted for pres ever) for the same reason I have always decided to stay home. My conscience will not allow me to vote the lesser of two evils. I did this year with the philosophy in mind “better a president that does nothing for the people, then one who does nothing good for the people”. So I absolutely agree with FM, the first guy to get in front of the people and sell to them that he is a “for the people” president, is going to be powerful indeed. I am intrigued by your comments, FM, because the political parties must have access to information that is at least as good as what is publicly available on the web and yet they are going in the opposite direction; concentrating on energizing their base while trying to persuade everybody else to avoid voting. Why are the political parties doing this when, as you point out, they could achieve much greater rewards if they engaged the non-voters? My fear (as opposed to a rational conclusion) is that they have discovered that the non-voters are much easier to de-motivate than they are to motivate. This would leave the parties fighting over slowly shrinking ever more polarized pools of likely voters. This isn’t the description of a stalemate, it’s a death spiral. Hopefully there is a better explanation than that provide by my fear. Um, yes, that IS what they had in mind. Of course, we’ve probably gone WAY beyond what they expected. Predictions of political behavior 200+ years into the future are guaranteed to fail. This is why, as you’ve noted, the Constitution must be a living document. I suspect everybody agrees on that these days, the arguments are on the mechanism for change, not the need. Great comments on parties and the Senate! As for parties, when looking at them its important to remember that they’re not unitary entities. They are alliances, somewhat ad hoc in nature, which in turn driven by individuals with complex career trajectories. I’m told the dynamics are simpler in Europe, with politicians more closely tied to their parties, the parties more focused (because there are more of them), and a higher fraction of career politicians. For example, politicos seldom jump so quickly up the ladder to the top. This has, of course, advantages and disadvantages for the system! But it should allow US parties to more quickly adapt to changing circumstances, as shown by the evolution of US parties during our history. My guess is that’s what we’ll see from the GOP during the next two years. 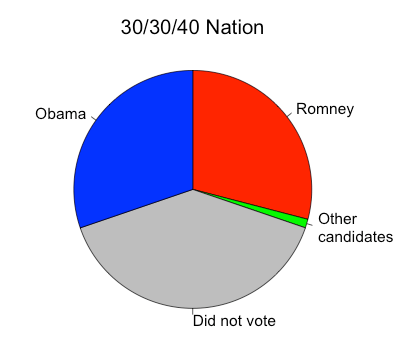 It’s a plurality of citizens not voting (40%, roughly). Other than that detail, that’s is my view as well.
. This is a great post that gets the wheels turning. I don’t know if young, poor, *and* disaffected are mutually exclusive. I’m young, poor, *and* disaffected with the current political system (though I do vote). Just wanted to point that out. Agreed. The clock ran out while I was word-smithing this, and that was a line I struggled with to be both clear and brief. They are distinct but overlapping categories. The Pell survey gives some details about this. And so we have a political process that resembles professional wrestling. It’s all about picking a side and convincing yourself it matters. Tribalism in this context should not surprise us, nor should lower voter turnout in segments of society who have less psychological investment in the established order. Thanks for posting this interesting research! Great post election round up by David Brin. I think you’ll like it Fabius. “Post-Election Roundup: The Road Ahead“, 9 November 2012. I am young, low-income, but with an associates degree and I do make sure I keep myself informed on politics, economics, foreign affairs, etc. Unfortunately, I also did not vote. For me, I would have to say I did not vote because I didn’t see opportunity/social mobility increase whether Obama took office or Romney. Also, I did not notice either candidate willing to do much for the poor besides maintaining their government welfare! As a matter of fact I don’t recall either president mentioning anything about the poor besides Romney (nothing good I should add). Call me old fashioned, but I believe that it is the poor that most of their attention should be focused on, not the middle class and wealthy. As for my peer group. Most are between the ages of 19-30, most are low-income and none have taken any time to get any college education. Every one is uninformed on any and all topics – by choice (they have the resources). The reason, it seems to me, that they did not vote is because they just simply do not care. I get the same apathy when I attempt to bring politics, economy, foreign affairs, etc. into a conversation that drags on about nothing – it kind of makes me laugh sometimes, but I know; its not a laughing matter. I know its not much, but I hope it gives a little insight into a small portion of that 40 pc. Maybe we need to think outside the box a bit? Want more people to vote? Give everyone who votes a $100 bill on the spot. Sure it would add $20B to the cost of each national election, but it would also stimulate the economy in the most patriotic way possible. that is very funny, candidates could swing votes their way by upping the ante. For example in red state Obama could have offered 120 and like wise Romney/blue. politicians who bring innovative ideas to the table that are sound and would bring progression in most if not all matters of state. Follow through with at least a few of the “promises” they made while campaigning. That would motivate more people to vote, but not to vote intelligently. If you buy a car, you will drive home in the car you bought, and be without the money you used to buy it. The concept of the “rational consumer” is way overblown, but it has at least some connection to reality. If you vote for candidate X… so what? Anyone not consumed by magical thinking must realize that ones chances of incurring a life-changing injury on the way to the polling place exceed the likelihood that one vote will change the outcome. Yet it’s only the final outcome that affects you; how you voted, by design, is secret and has no impact on you (aside from internal psychological effects). When we figure out a system in which it matters for whom I vote—that is, even though Barack Obama wins with or without my one vote, something is different for me if I vote for him, for Romney, for Gary Johnson, for no one at all—then, perhaps, people will be motivated to make rational political choices. Pay people to vote? It worked for George Washington: “Swilling the Planters With Bumbo: How George Washington Won Votes Before Campaign Ads“, by Julia Davis, Mental Floss, 28 August 2012. Paying people to vote is standard in third world countries, especially where desperation among the electoral pool is rampant. It usually takes the form of trucks, chartered by politicians or parties, with operatives distributing food, phone cards or other tokens just before election day. This system wouldn’t work in the U.S., where electoral fraud can be effectively prosecuted and goods are abundant. In the U.S., it would take the form of a dominance-dependence relationship, much like how payday loans, Buy Here Pay Here car notes and rent-to-own stores lock in desperate consumers into a bad deal. Since everyone can vote as long as they turn 18 and don’t commit a crime, the U.S. could reify that right as a tangible good. With 40% of voters committed to disengagement, political parties could be allowed to purchase away the voting rights of a person, who would relinquish their franchise for cash or other goods. I wouldn’t be surprised if this very same 40% would sell their right to vote for a plate of hot wings and a beer. Disgusted with the posturing, I changed my registration to “decline to state” a week before the election. However, I still voted for a writein for President, and declined to vote for the other offices in California. The state choices were limited a mandatory Republic/Democrat candidate after an open primary. I really cant stomach voting a candidate from either party. The writein was for Ron Paul. Bye bye to campaign contributions for anyone I cant see as ethical. That’s uncalled for. Call me a utopian theorist but I whole heartedly believe that the American people would not give there vote away for a damn cash reward! That is ludicrous! IMO. First, let me say I do like your blog and my comments are not meant to suggest otherwise. Second, the fact that you suddenly see me make comments related to various articles is not meant to suggest a shotgun approach, trolling, or that I haven’t thought through my reactions. Third, here is my comment, which is also partially directed to your request for evidence supporting my contention that you seem to lean a bit more left than right. The GOP has an economic agenda tilted strongly to the benefit of elites, and it has preserved support for that agenda — even though it disserves the majority of GOP voters — with implicit racial politics. That’s true today, but a determined effort by GOP leaders could change this. And yet I would disagree that “That’s true today..” Once again, I don’t deny there is a disconnect between the leadership and the membership, but that does not mean I agree with your premise. (1) I still see no support for your accusation of bias. That nice to hear, but not important. Critics are equally welcomed bere. Don’t worry about any of that. Nobody has said or implied such a thing. So you disagree with Kevin Drum’s statement (not mine, although I agree with him) about the situation. And that makes me biased? The relevant point is that Drum (and the others cited here) provide ample evidence for their beliefs, whereas you merely repeat that you disagree. I think that supports the broader theory given in this post. The Right is locked in a loop, incapable of defending many of its views — no matter how far out of synch with reality they become. Your comments above illustrate this quite clearly.